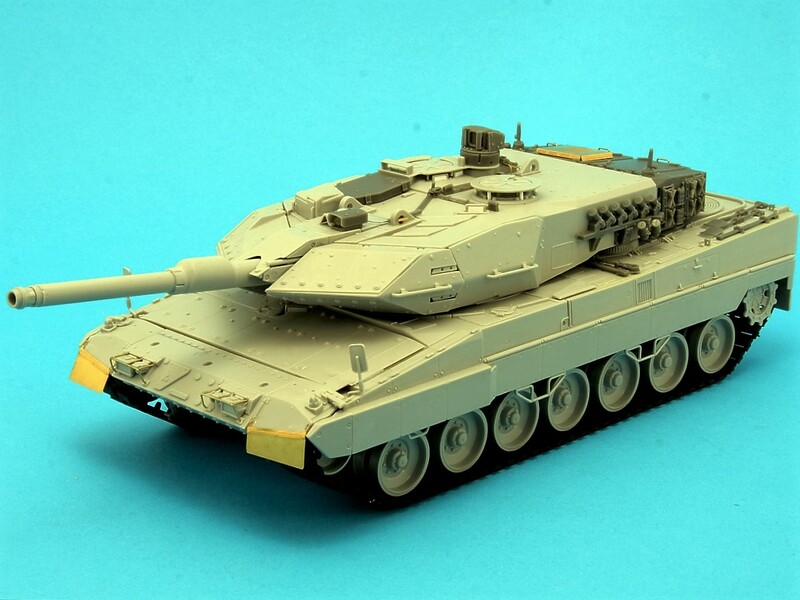 A very comprehensive 1/35th scale resin conversion of the SKYBOW M41 Walker Bulldog kit into the Danish M41 DK1. 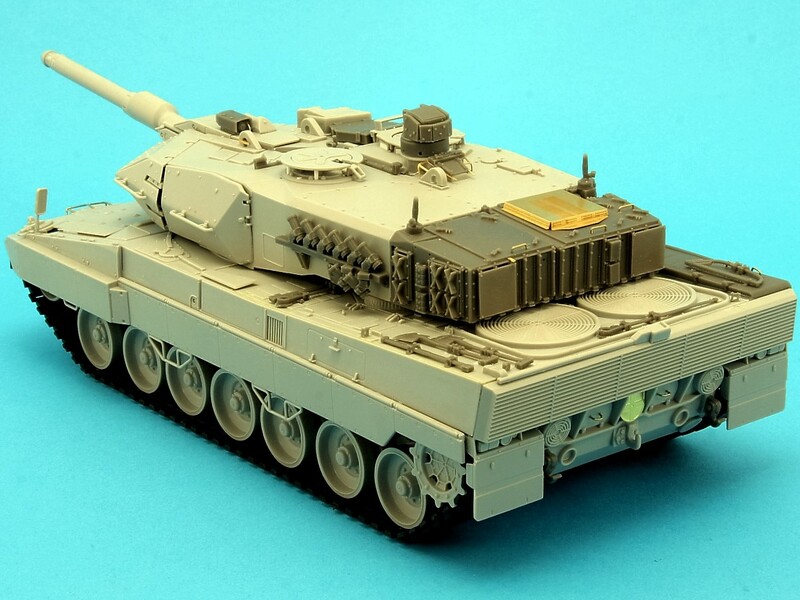 This extensive 1/35th scale Resin and Etched-Brass update set transforms and corrects the Hobby Boss Leopard 2A5DK kit (82405) into a corrected and better detailed model of the Danish Leopard 2A5DK. The master model was designed by Jon Bottomley with research and historical background by Thomas Antonsen. 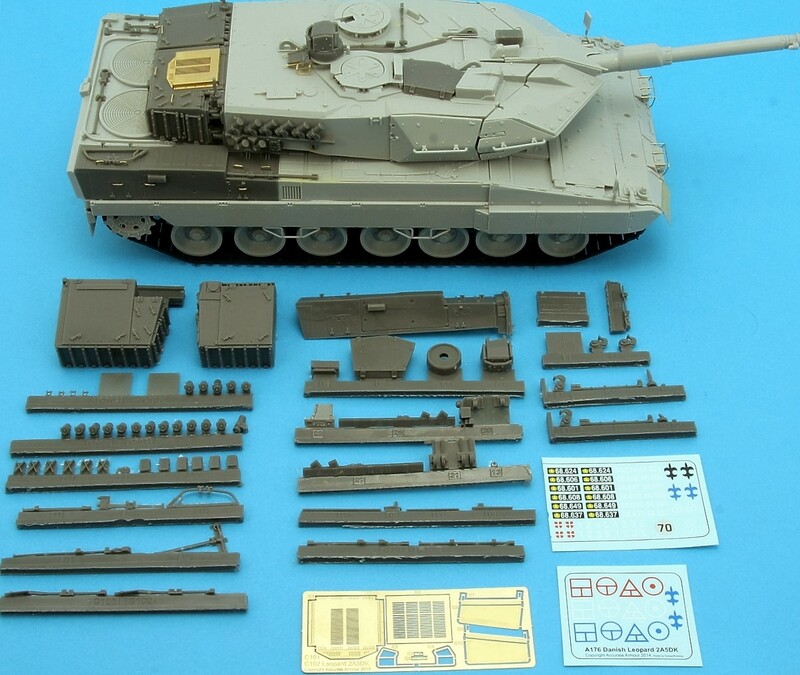 The set includes a small selection of markings and full conversion instructions. History: The Leopard 2A5 DK entered service with the Danish Army in 2004. The Danish variant of the Leopard 2A5 is the apex of 30 years of development work of the Danish Army, as the Danish Leopard 2A5 is based on all the experience gathered in the Danish Army from using the Leopard 1 since 1976. 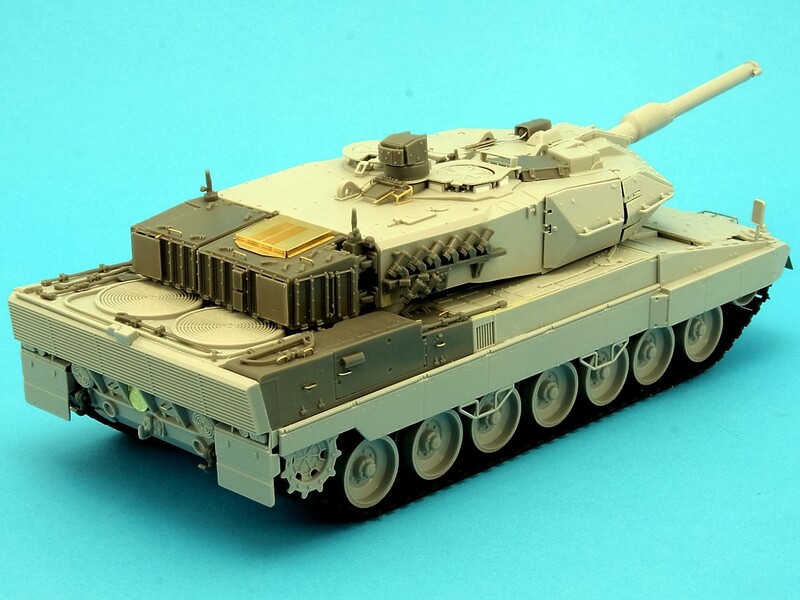 In particular, the experience gathered from the last version of the Leopard 1 in Danish service, the Leopard 1A5 DK1 (SFOR) which among others was equipped with new turret boxes, housing among others an APU and a cooling unit. 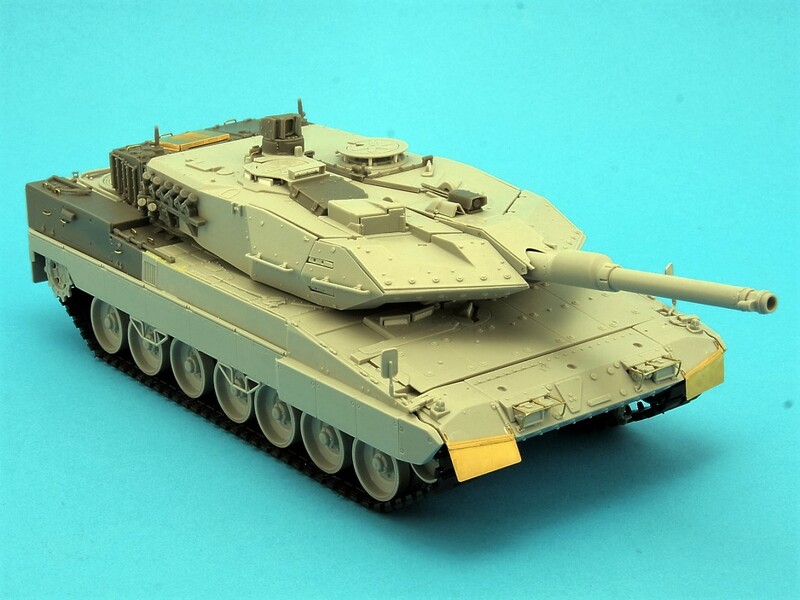 Thus, though the Leopard 2A5 is very much a “NATO standard tank”, the Danish version has some features, which were unique among all the other Leopard 2 users, when it entered service. Since then, these features have been incorporated into other Leopard 2 versions, for instance the Spanish Leopard 2E, which shares both the rear turret boxes, and the Auxiliary Power Unit (APU) on the right rear hull with the Danish variant.Detail: Compared with the German version of the Leopard 2A5, the Danish modifications are in total:External modifications to the turret:· Rear turret stowage bins with racks for track grousers (the right box holds an MKK 3 air-conditioning unit from KMW).· The racks for the smoke dischargers are placed in a ‘six-plus-two’ configuration, rather than the ‘four-plus-four’ configuration.· The antennae bases are situated between the rear of the turret and the rear turret bins.· The commander’s sight has been armored on the sides and the rear of the sight unit. The area behind the sight is covered with a lid and has a number of connection plugs for, among others, the FESAP and laser dueling equipment.· A box for Diemaco C8A1 carbines in front of commander’s hatch.· Two racks for Diemaco C8A1 carbines on the roof.· The Set Beam searchlight next to the gunner’s sighting binocular on the turret roof.External modifications to the hull:· The frontal armor which is very similar to the bow armor seen on the Swedish Strv. 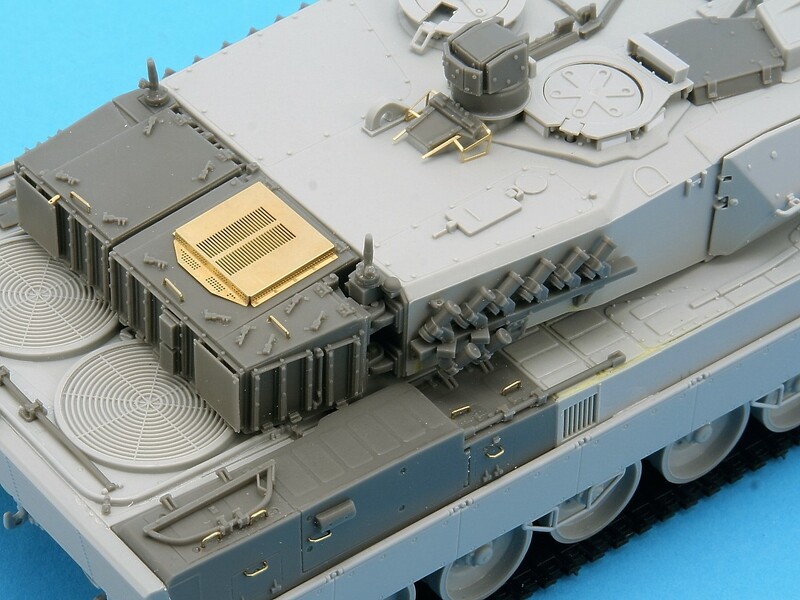 122 MBT.· An Auxiliary Power Unit (APU) is built into the right rear corner of the rear hull and, as a consequence, the right rear hull is significantly higher and more angular than the hull on German Leopard 2A5s.· A small toolbox is situated next to the APU box.· On the rear hull wall are two flat lids each side of convoy light, rather than the two boxes found on the German Leopard 2s. 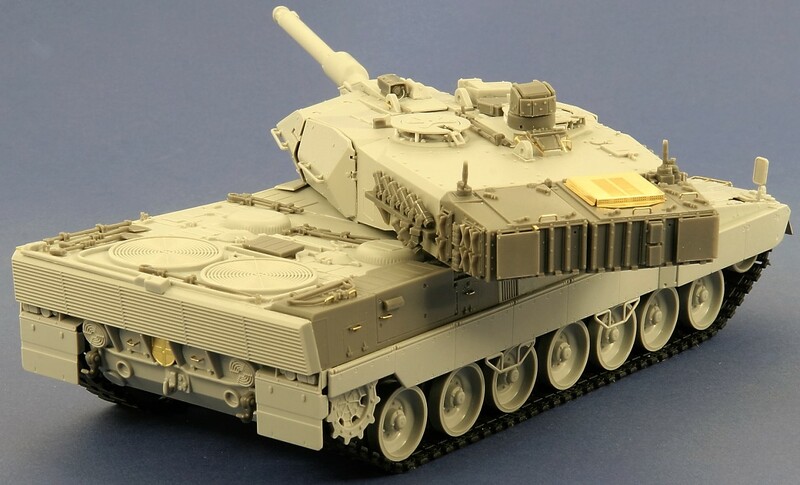 On some of the LEO 2A5s, a small oil container is mounted on one of these lids.· Attachment of the final (rearmost) of the heavy side skirts is different to German or Dutch Leopards 2s.· Tool brackets on the upper hull are a different version compared to the brackets on the German Leopard 2s.